If you’ve read my other posts, you might be wondering why I traveled to Japan when I don’t like sushi (or green tea, or mushrooms…. I know, I’m a monster). The main reason was that I wanted to go where the wild things are. 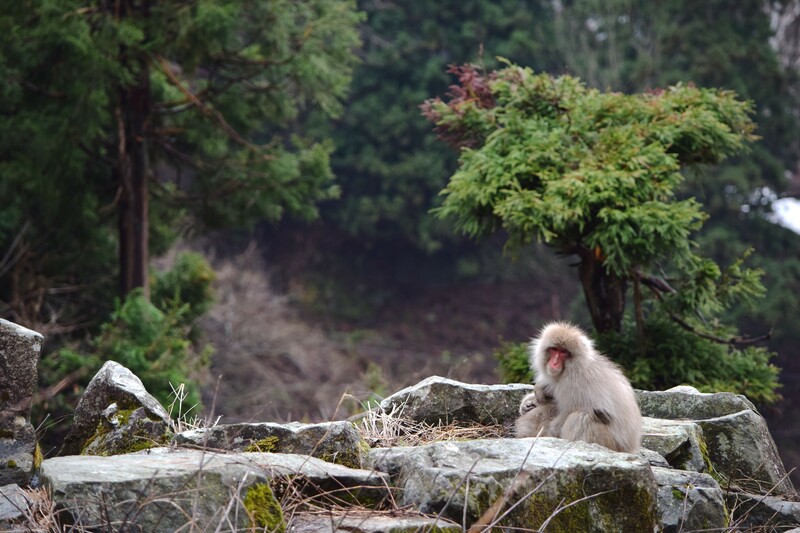 There are wild things in Japan, specifically, monkeys. We can disregard the other infinite reasons that people travel besides food and animals because I can’t relate. Monkeys are big tourist attractions in their countries of origin. I say, if you’ve got it flaunt it…just don’t exploit it. Monkey based attractions run the spectrum from monkeys in costumes dancing and posing with you (see: exploitation) to monkeys living their best life in the wilderness. Typically, if someone is charging you for a photo with a “pet” monkey, something is amiss. Spoiler alert: monkeys have sharp teeth and poopy hands so if you’re not in danger, at some point that monkey probably had an involuntary dentist appointment. A middle ground does exist where monkeys run amok stealing Cheetos and festive beverages from tourists but that’s kind of a fair fight. Either way, the goal is for no one to get slapped around, have teeth (or spirit) removed, or end up lost in an Ikea (which is a terrible fate for anyone). Monkeys living their best lives in Japan. Also is this a renaissance painting? I was lucky enough to have a connection to a Japanese primatologist who told me where to find native monkeys in close to ideal circumstances. If, for whatever bizarre reason, you don’t happen to have a direct line to an expert in animal welfare to vet your travel plans, the internet is also good resource. It just requires some extra effort: less like researching a good restaurant and more like googling the person your friend is dating. Find the info, find all of it. Not every situation is black and white, some are grey, like with elephants, and you have to choose what you meets your moral standard (which I’m assuming is high if you’re still reading at this point). While we’re on the topic of the internet, if you’ve ever been on there trolling for cute animal pix (again, you’re here… so probably), you’ve seen this monkey on a cell phone. Obviously I wanted to see that in Japan, and so my guide sent me to Shibu Onsen, in Nagano Prefecture. 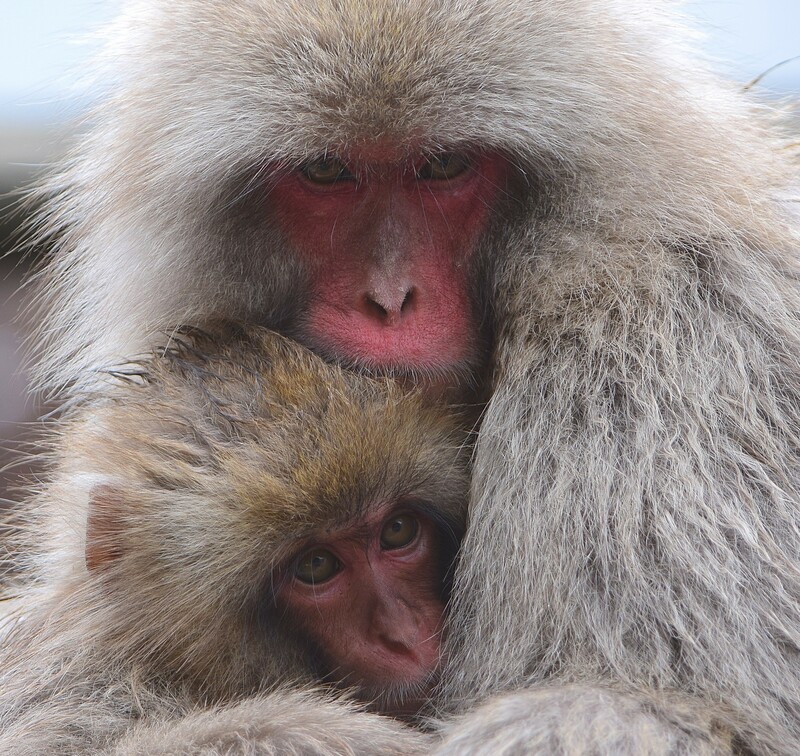 Nagano is the birthplace of Soba noodles, a Japanese hot spring/spa vacation destination, has fluffy monkeys, a dope winter sports scene, and hosted the Olympics. NagaYES. DIY soba kit. 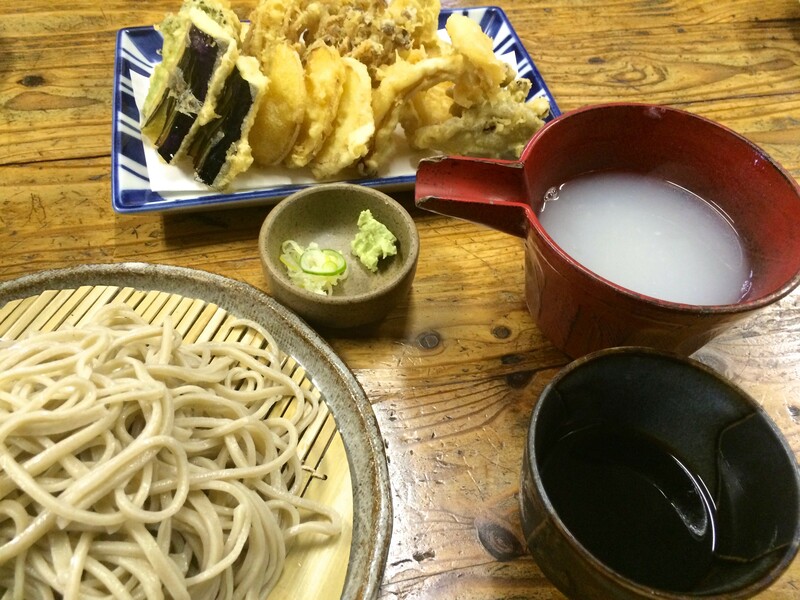 It turns out there is more than one way to soba. 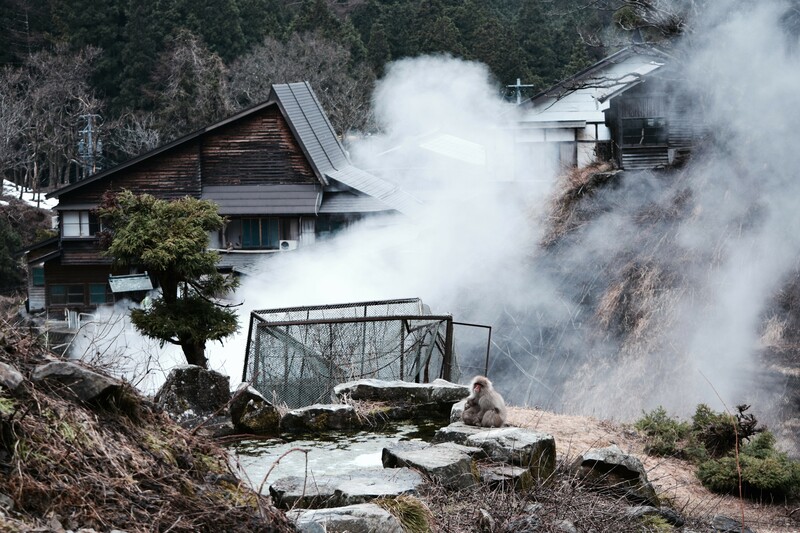 I would say the majority of people in Shibu Onsen are there for the hot springs for humans with maybe a visit to the monkeys as an added novelty. People stay in local ryokans (traditional Japanese guest houses) and then slap on some bath robes and hobble (because cobble stones and slippery, wooden death trap sandals) from one hot spring to another. I had the inverse preference – monkeys first – so as soon as we kicked off our shoes at the ryokan (and put on our indoor slippers to check-in, and then put on our bathroom slippers to go use the restroom, and then put back on the indoor slippers to walk through the lobby, and then changed back into our hiking shoes) we were off the Snow Monkey Park! 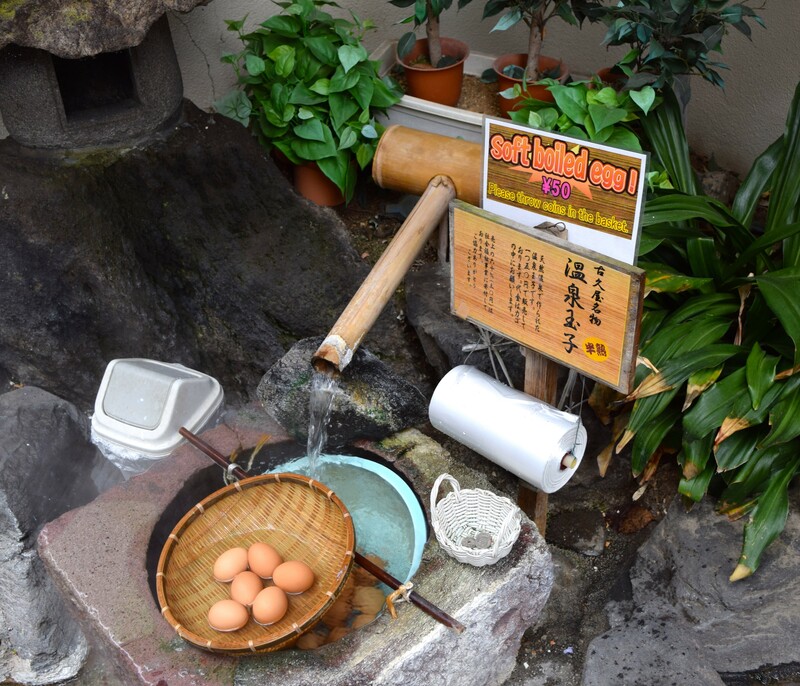 Honor system hot spring boiled eggs outside the ryokan- it’s lit. The park was a short hike from the parking lot but it felt like an eternity wishing that every stump and rock and puff of hot spring mist was a monkey “Is that a monkey? Is that a monkey? Is that a monkey? Are you my mom?” Finally we got our first glimpse of monkey and a baby bonus monkey. The most majestic and mysterious of monkeys. 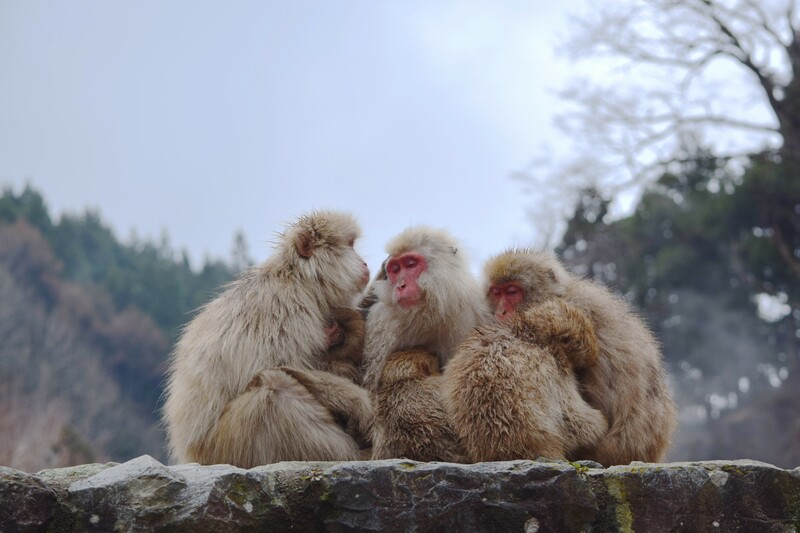 So, I tricked you into reading this entire post about spa monkeys without showing you any monkeys in the actual hot springs. Sorry not sorry, my next post is all bathing monkeys all the time. You earned it for reading my monkey PSA and learning about Nagano and how to be a nice primate to other primates. ‘How to be a nice primate to other primates.’ I guess you can check that box. Great post, well-written, and the pic at the end…gorgeous. Monkeys — and I’ll dare say even humans — are best left wild. Love your humorous writing style. We are hoping to go in November. Cannot wait! !